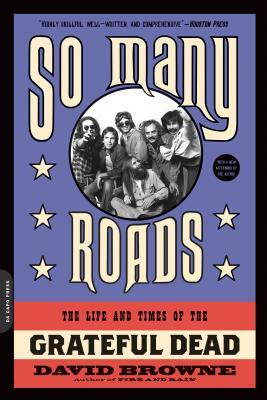 So many roads is a great perspective of the history of the Grateful Dead. They toured relentlessly and employed so many people that it became "a machine." This responsibility left some of the band members feeling resentful and that they had no choice but to continue touring. Challenged to change with the times, they played The Acid Tests and made music videos for MTV and everything in between. After 50 years, members of The Grateful Dead continue to play their music. More than five decades after they first came together and changed the sound of rock 'n' roll, the Grateful Dead remain one of rock's most beloved bandsa musical and cultural phenomenon that spans generations and paved the way for everything from the world of jam bands and the idea of independently released music to social networking. First published in time for the band's 50th anniversary, So Many Roads is unlike any other book on the Dead it is, in the words of Eric Alterman in the Huffington Post, "the best narrative I've ever come across" of the Dead. Drawing on new interviews with surviving members and those in their inner circlealong with access to the group's extensive archives and his own research from years of covering the grouplongtime music journalist and Rolling Stone contributing editor David Browne does more than merely delve into the Dead's saga. By way of an altogether unique structureeach chapter centered on a significant or pivotal day in their storyhe lends this epic musical and cultural story a you-are-there feel. The result is a remarkably detailed and cinematic book that paints a strikingly fresh portrait of one of rock's most enduring institutions and sheds new lightfor fans and newcomers alikeon the band's music, dynamics, and internal struggles. David Browne is a contributing editor at Rolling Stone and Men's Journal and is the author of Fire and Rain: The Beatles, Simon & Garfunkel, James Taylor, CSNY, and the Lost Story of 1970 as well as biographies of Sonic Youth and Jeff and Tim Buckley. His work has appeared in the New York Times, Spin, The New Republic, and other outlets. He lives in Manhattan. "Browne presents the ultimate road map of the life and times of a band that has always been a unique American cultural phenomenon."